This post simply comes out of an interesting article I found about hyper inflation. We all know what inflation is, right? Here’s a quick explanation: a one dollar bill printed in 1900 was worth one dollar. A dollar bill printed in 2010 is also worth one dollar. The value of that dollar has changed. Loosely translated, this means that in 1900, your 2010 dollar would be able to purchase about $25 worth of stuff. Naturally, inflation has its ups and downs (literally too) and it also means that no matter how long you keep your paper money, it’ll never be worth more than the little number printed on it. In fact, the value will actually go down the longer you keep it. This is quite the opposite of gold by the way. If you had just one ounce of gold in 2001, you’d have about $300 in real money. If you held onto that same ounce until today, you would now have $1100! So gold beats inflation. Imaging if our country was still on the gold standard: there would be hardly any inflation…movies would still cost $0.10, cars would still be under $1000, etc. There are critics on both sides of that argument, but I’ll leave that to another day. This country suffers from up to 2 million percent inflation prices! That’s insane! What’s even more crazy is the denominations of their paper money. Just recently, they printed a $100,000,000,000 note. One hundred BILLION dollars! Well I guess I don’t have to explain that to you. 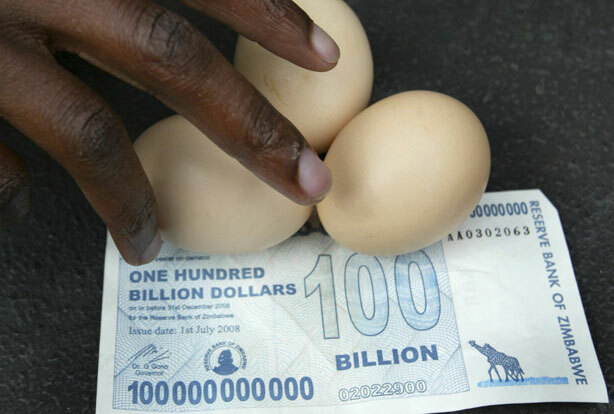 It’s amazing to imagine a country where a $100,000,000,000 bill can’t even get you a dozen eggs. By the way, eggs are cheaper in Zimbabwe than here in the U.S. so stop complaining! This must have been written in 2008 – the largest bill they printed was the 100 Trillion Dollar note, and the country abandoned its currency in early 2009. Inflation since then has been under 5 percent.